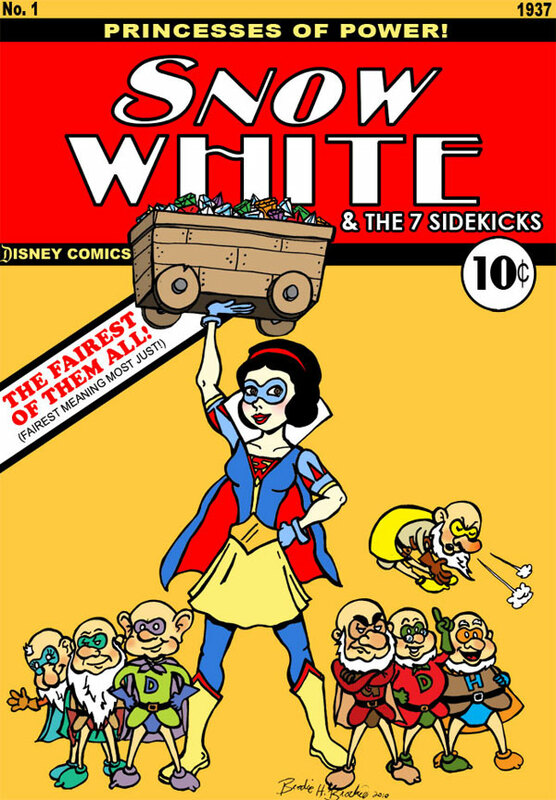 SNOW WHITE: The original Disney princesses gets the most classical superhero costume, drawing inspiration mostly from Superman and Robin (in addition to SW's own gown, of course). She's in hiding from the wicked queen, so that explains the mask. The seven dwarfs are thrown in as the seven sidekicks in more generic, slightly sillier costumes as a free bonus offer. Doc - Super intelligent, natch. Grumpy - flies into Wolverine-style berzerker rage. Sneezy - Incredible concussive nasal blasts. Sleepy - Super contagious yawns render his foes drowsy. Happy - Flings sweat laced with chemicals that send his enemies into a blissful trance. Dopey - No change necessary. Dopey is already a ninja. Bashful - Bashful has an astonishing and incredibly potent super-ability, unfortunately he is too shy to use it or even tell us what it is. Dopey is already a ninja. LOL! I'm dead! Ha ha - I am sorry to have killed you. Super superheros! I'll be writing a post on your work. Dopey the Ninja does kill. I bet he'll get his own spin-off series some day. Thanks, SWS! That Dopey is going places!